I want to buy a Masters degree that is recognized in Thailand. Not a KSR one but from a real institution. Anyone know? You can take a Masters Degree program in Thailand if you have a Bachelors Degree. Some Thai schools even offer online degrees I believe. If you study English, the teachers will probably go very light on you as you're probably going to be as good as they are with the language in a lot of cases or at least because you easily out perform your peers in class. ^ In some Thai universities, the difference is minimal. The local suppliers generally rent sincerity and integrity as they are only needed occasionally. Ok time for me to be a doctor then. Forget a Masters degree, I want a Knighhood. Bum bum bum bum - He's so blue. I'm confused; when you say you dont want a fake KSR degree. Real ones normally require you to work, buying a degree normally means it is fake, aka KSR. Unless you are talking about a life degree and you can google that. I have been thinking about this too, however what is the use? 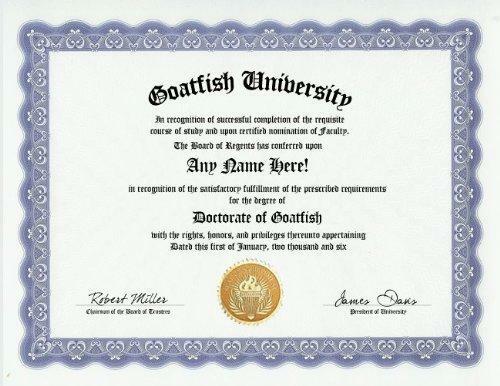 If you need one for getting a better position, you have more use for a educational degree. Having this said...... what do you think of my following statement? The Thai students on primary and high school are so incredible lazy, if you are a construction working with no degree and you are original from the North Pole, even than you can teach English in Thailand. When I enter a new class, let's say grade 10 (9 years of English lessons already!!!). I ask a few simple questions like: what is your name? Where do you live? How old are you? And the most difficult question: what is the number of your house? WHAT should you teach those kids????????? WHAT could you teach those kids????????? You're working as an English teacher, right? If so I wouldn't complain too much, if I were you. Give him a break, English is probably his second language. That's a rhetorical question and a statement of surprise so an apostrophe should be used instead of a question mark. The word "right" is not necessary. The comma in the next sentence should come after the conditional phrase. You're working as an English teacher! If so, I wouldn't complain too much if I were you. BTW, I'm not interested in a Masters anymore. That's some serious bull shitting in that article, funny as fook.